We are very happy to announce that our Chrome Plugin has been updated, restoring authenticated free access to our key Majestic metrics. In early October we took the decision to suspend free access to our Chrome and Firefox plugins. This was due to huge numbers of automated queries which resulted in this valuable service being disrupted for genuine users of our tool. In order to manage access, we had implemented automated throttles on the underlying api, which we call the SimpleAPI, used to support the tool. However, the levels of abuse ( almost to the extent of being a DDOS attack ) had resulted in the SimpleAPI being unusable to human beings, undermining the plugin and causing widespread dissatisfaction. We promised that the suspension of service was temporary, and after investing substantial developer time to rewrite the plugin and underlying API, are happy to announce that we have today updated the Chrome plugin to return link counts, flow metrics, backlink history data and the Link Profile chart FREE without a subscription. So that we can make this work, and in an attempt to reduce the effect of automated scraping, we have now implemented the reCaptcha service to authorise free use of the plugin. The number of links to the web page, the domain, and subdomain. The number of domains that link to the web page, the domain, and subdomain which hosts the web page. Citation Flow: How strong the links are at each of these levels, as a score from 0-100. 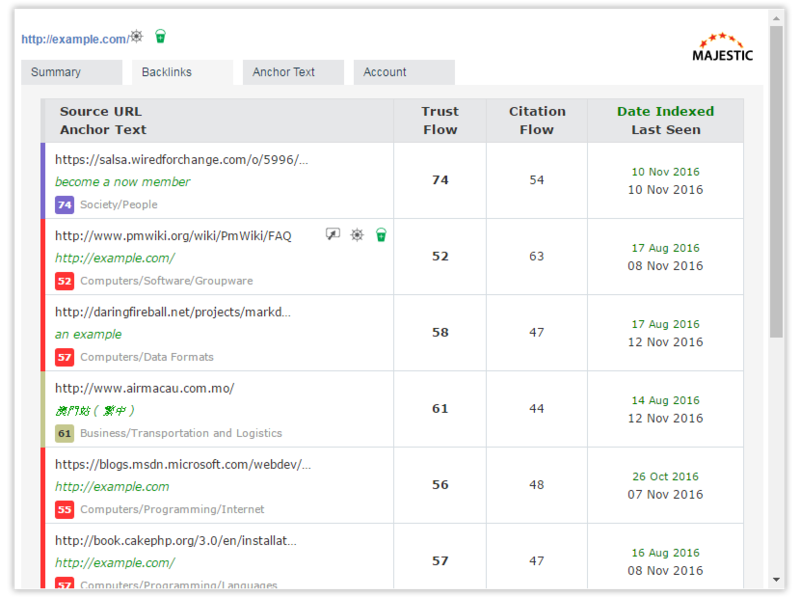 Trust Flow: How trustworthy the links are at each of these levels, as a score from 0-100. A link profile chart, which is a graphical representation of the Trust Flow and Citation Flow of all these links. Timeline charts of how this page acquired links and referring domains over time. As well as the free Summary, linking the plugin to your Majestic subscription opens up two new tabs, Backlinks and Anchor Text. 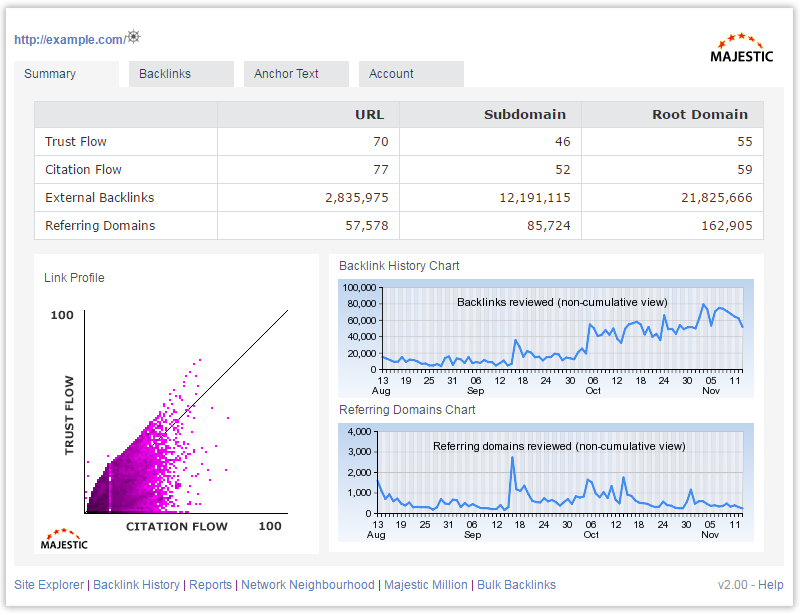 The Backlink tabs shows you the top incoming backlinks for your current page, with the Topical Trust Flow, anchor text, Trust Flow, Citation Flow, and key dates for each incoming backlink. Deleted links are not shown, and we have limited the results to only show 1 referring domain. Remember that this search will usually be at the URL level. If you want to drill into the subdomain, or root domain. you can use the links at the bottom of the toolbar to drop your search term straight into Site Explorer and change scope. 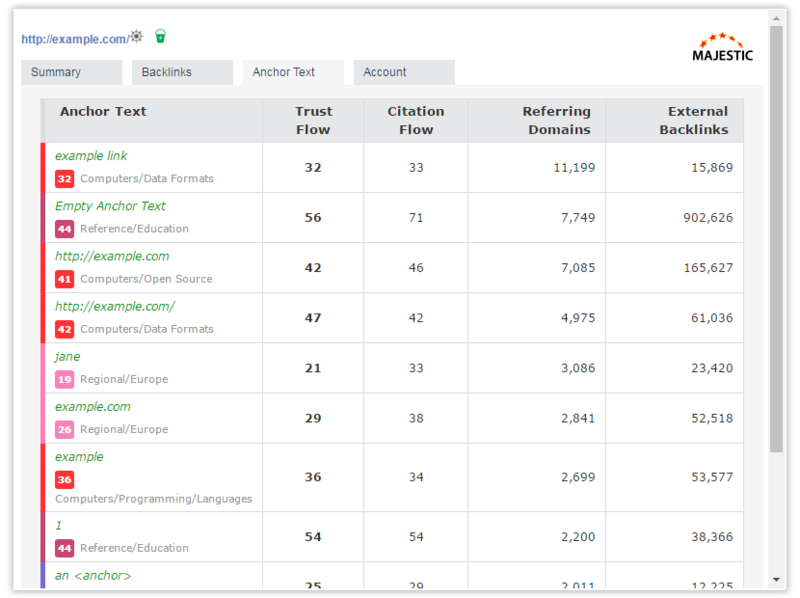 This tab will aggregate the anchor text for your URL, showing you the top anchor texts, with the number of referring domains and external backlinks using that anchor text. We also show the top Topical Trust Flow for the anchor text word or phrase. At any time, subscribers can add the current URL, subdomain, domain, or external backlink to their Majestic bucket, without breaking stride. Just click or tap one of the green buckets in the plugin to add that item. When you next go to the full Majestic site, your treasure will be waiting in your bucket, ready to be checked, run through bulk backlinks, added to a campaign, used in an advanced report, set up for email alerts, or anything else that you can think of on the Majestic site. We have to admit that we never expected our plugins to be as popular as they became, and we fully admit that the previous integration with openapps was a little unwieldy. We have taken the opportunity to rewrite our OpenApps authentication method, and hope that valued customers will enjoy a far smoother user experience. 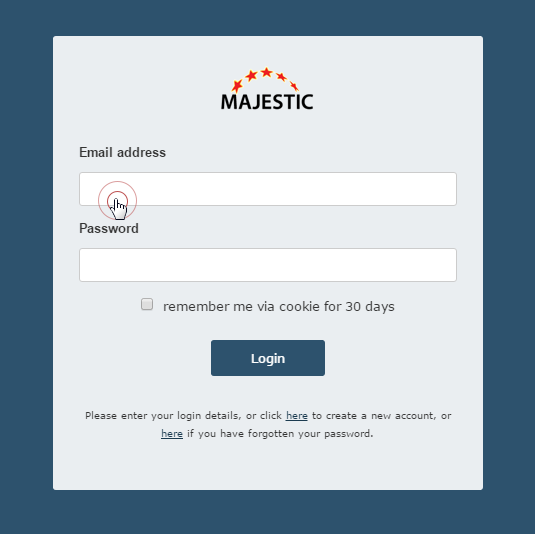 For Majestic subscribers, this is really easy, just press the big Authenticate button, sign in to majestic.com, press a button to authorize, and you’re in. Your browser plugin will then be signed in permanently (while you continue to have an active subscription and resources ). As a subscriber, more details are available in the plugin; top backlinks, and most popular anchor text, and many, many more views of the summary stats are available than for free. Our plans start at just $49 a month – HALF the cost of our competitors. Remember that using the plugin will use your Majestic data allowance. The battery icon in the Accounts tab will let you know how many of your monthly resources remain. 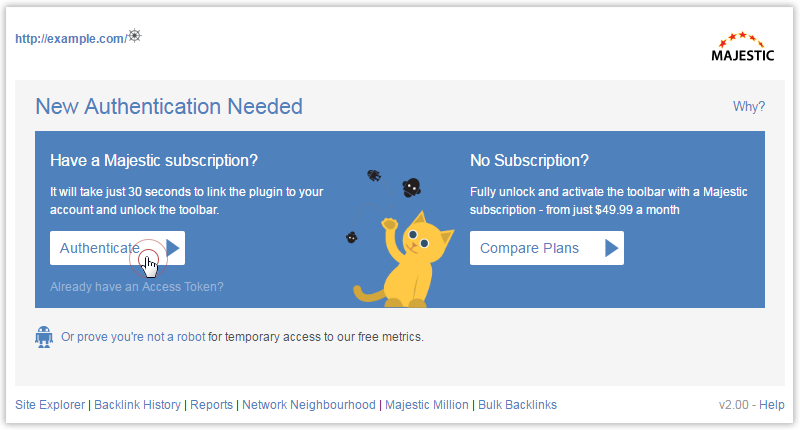 If you do not have a Majestic subscription, we have added a reCaptcha which will reward you with free access to our key metrics. The reCaptcha authentication doesn’t last forever, and if you’re a heavy user of the free service, you may have to authenticate more than once in a session. With apologies to our many users on Firefox, we are still actively working on the plugin for your browser, and hope to have it with you very soon. 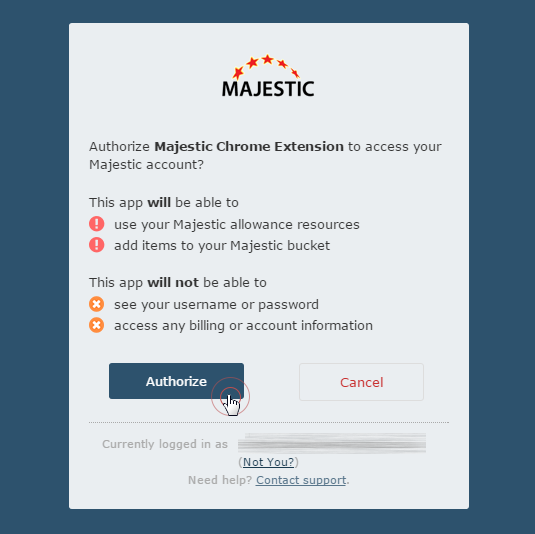 If you follow our Twitter feed @majestic, we’ll tweet when it’s ready to update. We have spent a lot of time and resources to return our free data feed to your favourite browsers, and we really hope that our authentication procedures help maintain the balance between genuine users and scrapers. However, if this service gets abused please note that this may be our last “spin of the wheel” in terms of free access plugins – we love our fremium model, but draw a line at diverting huge amounts of development time to subsidise the businesses of others, at the expense of our own. If you have been writing bots to scrape our data, then please get in touch to have a chat about how we can help you with your ideas, and remove the worry that your unauthorised access may cut-off at any time. We have a dedicated Sandbox area and developer API where you can get your applications up-and-running in a non-chargeable environment with our test API – before you pay a cent. If you are using other tools to try to lookup back-link counts, flow metrics or other data, please be careful to use a reputable supplier. We have a list of preferred suppliers for third party access to our systems. You can also access our data through third party tools using the OpenApps protocol with any paid account. Our OpenApps directory is here. Cut off the hand that fed ya’, huh, guys? Hopefully we’ve cut off the hand that stole your free tool! You don’t get fed by getting scraped… we all just get hungry! I really like the idea of Recaptch, I was thinking you will completely remove free chrome plugin. But I am very happy that you did not and found the solution for bots.